The International Association for the Plant Protection Sciences (IAPPS) aims to “promote and support an integrated, scientific approach to plant protection,” facilitating the “rapid and efficient sharing of information across continents” to help prevent new invasions of harmful pests around the world. 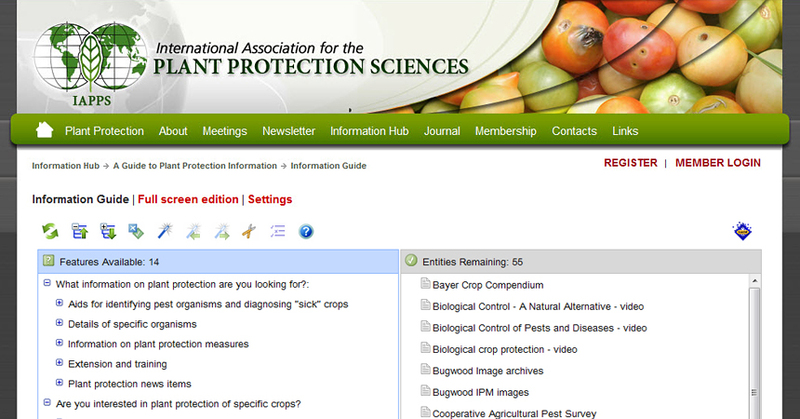 As part of this mission, they offer a wealth of links to online plant protection information and training resources through their “Information Hub.” The “Guide to Plant Protection Information” is presented in the form of an interactive Lucid key, where the “features” are questions that help you narrow down exactly what your plant protection resource needs are, and the “entities” are a variety of online resources. As you select the topics you’re interested in on the left, the choices on the right are narrowed down, just as in any Lucid key. The “entities” are linked to fact sheets that describe the contents of each site and offer links to them as well. Once you click through to a fact sheet, you will also find options to browse or search these fact sheets. Several of ITP’s products are included in these resources, including our ID Tools, sets of ID Aids (Fruit Fly – Drosophila information, Tuta absoluta information), and the Bugwood ITP Node (USDA-APHIS-ITP Image Node).